1. Sifu Sam Ng and members of Ng Family Chinese Martial Arts Association. 6. 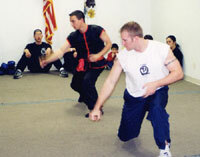 Instructor Pawel and Instructor Keith demonstrate Choy Lay Fut forms. 2. 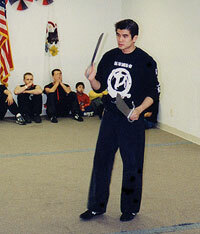 Sifu Phil Ng explaining the usage of the Ving Tsun double blades. 7. 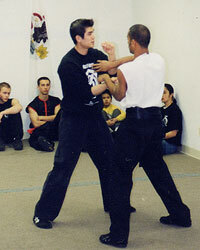 Sifu Phil Ng explains the differences between armed and unarmed combat. 3. 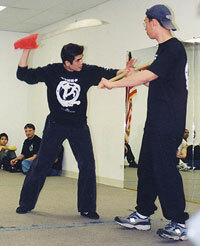 Sifu Phil demonstrating chi-sao exercises. 8. 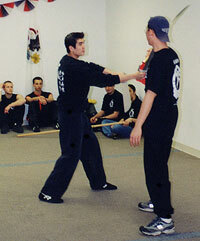 Sifu Phil Ng demonstrates using the southern broadsword at close range. 4. Sifu Sam and Sifu Phil lead a warm up session before the start of the Choy Lay Fut seminar. 9. More Choy Lay Fut Kung Fu. 5. 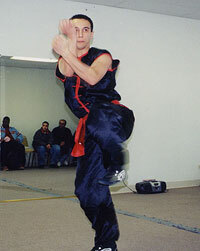 Instructor Pawel Grzeda performs Choy Lay Fut's Lohan Fist form. 10. 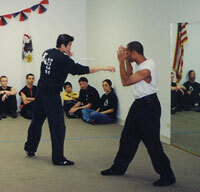 Sifu Phil explaining the concept of distance in combat.